With a constant stream of innovative updates that continue to excite, Instagram Stories has shown no sign of slowing down. With over 250 million users on the platform, it’s time to start strategizing how you can leverage Instagram Stories for your visual business. Instagram Stories is an awesome platform to not only show off your creative style, it’s also a fantastic tool for growing organic engagement, increasing brand loyalty, and driving traffic to your website or portfolio. In this Guide to Instagram Stories, we’re going to review everything from strategies you can implement to increase your engagement, to tips and design tricks that you can use to make your Instagram Stories unforgettable. Instagram Stories swept the market for platform growth in the past few years. So why the extreme growth? It starts with mobile usage. 73% of people say their device is always with them. Checking their phones at an average of 150x per day. So out of all those checks, how often do we find ourselves aimlessly browsing Instagram Stories for new content? When it comes to mobile usage, an astonishing 50% of all mobile data comes from mobile video traffic. Instagram Stories makes it easy to consume this video, with non-stop changing vertical videos. On average, vertical videos receive 9x higher engagement than horizontal videos on mobile devices with a 90% higher completion rate. And on Instagram Stories, vertical video takes over the entire screen. Why should you use Instagram Stories for visual business? When used to it’s full potential, an engaging Instagram Story can be incredibly impactful. 7 million businesses make stories monthly. Whether you want to share light hearted content, or drive traffic to your website or portfolio- Instagram Stories can be used as a way to engage your audience both personally and as a business strategy to increase visability to your business. We've outlined some strategic techniques that you can use to start growing an audience to your work through Instagram Stories. Whether your building brand loyalty, or driving traffic to your portfolio- you can use these techniques to direct your followers to go to the places you want them to see. Industry tip? Before you start making Instagram a part of your visual business, make sure your portfolio is up-to-date! Improve your portfolio with tips from this article. Opening a business account on Instagram and growing your audience to be verified (over 10k) allows you to out link to content through stories, as well as gives you in depth insights into how your audience interacts with your stories. To add links, simply click the link button at the top of the story after you take or upload a picture. Enter the link you want the post to go to. To make sure it works, you should see the “See More” tag line at the bottom that will open your linked content. Alternatively, if you can’t tag within stories- use a call to action to direct them to a link in your Instagram bio. This is a great work around if you can’t add links to your Instagram Stories. Instagram Stories that tag other users generate 56% more engagement. Foster a community by collaborating with other creatives or businesses you work with. Tagging other users is simple. Simply write the @ symbol, followed by the handle name. You can contribute to hashtags using the same strategy. By writing the # symbol, followed by the hashtag you'd like the story to contribute to- you'll show up on that hashtag's story and can potentially reach a greater audience than the one currently following you. Create good CTA's on your posts to engage with your audience even further. Good practice is to act like a brand, every message you give your audience should have a purpose that has a positive impact on your visual business. Examples: Ask your audience their opinion, direct them to your website or blog, promote a new Instagram post you've just posted, or talk about a trend or community you're passionate about. To go live, on the app, swipe left to the “Live” option and tap “Start Live Video” to broadcast yourself to your followers and host a Live Chat. Great ways to use this? Ask me anything sessions, learning sessions, and on-location at pivotal events. 1. Include a call to action to turn on the sound in a post leading up to the post with sound. 2. Explain what you’re talking about using text on the image, so sound becomes optional. Instagram Stories new Highlights feature was one of the biggest IG updates of 2017, and the recently launched Type Mode update is another release our team can't stop talking about. With Highlights, you have the ability to curate and pin permanent collections of Instagram Stories viewable directly on your Instagram. With the newest release, Type Mode, you are able to share your thoughts and words in a variety of different colors and font styles- with or without a picture! These are two huge updates for photographers on Instagram, as you now have the ability to curate your stories into Highlights collections for increased view time by potential clients and collaborators, as well as create engaging text stories to compliment your images. To view the full article on this release and how you can use it on your stories, click here. Good news! You do not need to post when your followers are most active. Stories exist for 24 hours, so if your audience is engaged with your content you could be at the top of their feed. It’s more important that if your story contains multiple visuals that work together to form a story, that they are posted at a similar time so that all viewers see the whole story. For example, the brands we create stories for here at Shutterstock Custom have had our contributors pre-shoot all the content, and then they post it on their Stories according to their marketing schedule. Because Instagram Stories only exists for 24 hours, Instagram won’t penalize your account for posting stories too often- unlike regular posts to your feed. We're sharing some of our top design tricks and business tips on how you can make your Instagram Stories stand out from the rest. Editing your Instagram Stories in apps that fit your style is a fantastic way to make your stories stand out. You can upload photographs from your DSLR or use phone pics in these apps. Use apps to add typography, unique stickers and fun backgrounds to enhance your Stories and make them unique to your visual brand identity. Some examples of our favourite: Over and Canva, where you can put different types of text and backgrounds on your images. To create a solid color background, select the color of your choice then tap and hold a spot on the screen for 1-3 seconds until the screen is filled with color. We love using this tool on image overlays. To do this, open the app and snap your Story. Select a drawing tool and create a solid background (as directed above), then use the erase tool to reveal elements of your photo. It’s a great way to draw attention to one aspect of your image in a unique way. A color fog is a really interesting tool you can add to your Instagram Stories that's also really fun to play around with. Simply select an emoji in a color you like, then expand it! For example, you select an orange for orange, an eggplant for purple, or a leaf for green. The more you expand, the more the edges will fog out. Drag to a corner, or over the top - and you’re done. Instagram recently announced a new color picker that allows you to select a wide array of colors for your text or drawing tools. When you choose a color for your text or drawing tool, you’ll see a new eyedropper icon at the far left. Use it to select any color from your photo or video and apply it to your text or drawing tool. Alternatively if the color you are looking for isn't in your photograph, you can custom select a unique color you'd like by clicking on any color in the bar and holding for 2 seconds until additional options pop up. Shadowing your text is a fantastic way to make your message stand out. Start by creating a text in your desired color. Then, make the same text in a different color. Drag them on top of each other, just slightly off balanced to create a “shadow” mimic and your finished! 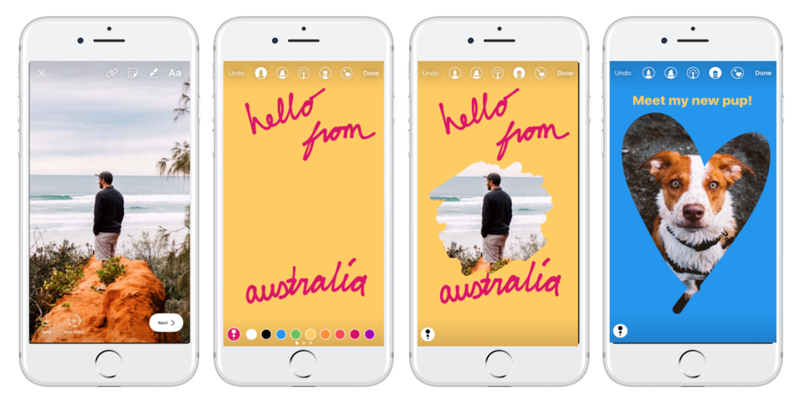 Instagram stories has three main customization add-ons you can use once you take a photo or video: stickers, text, and doodles. Click on the sticker icon at the top of your Instagram Story to see the full library of various decorations. Some are interactive, and will change depending on your location, weather, or special event happening. Others are always there as fun add-ons you can use to personalize your Story. Just launched this month, you can now host polls on Instagram Stories! An interactive poll sticker is available that lets you ask a question and see results from your friends and followers as they vote. After you’ve shared your poll, your friends and followers can immediately start voting and see real-time results. To see your own poll results, swipe up to open the viewers list for that part of your story. That wraps up our Guide to Instagram Stories. For more inspiration, check out these tips from professional photographers on how to use Instagram Stories. 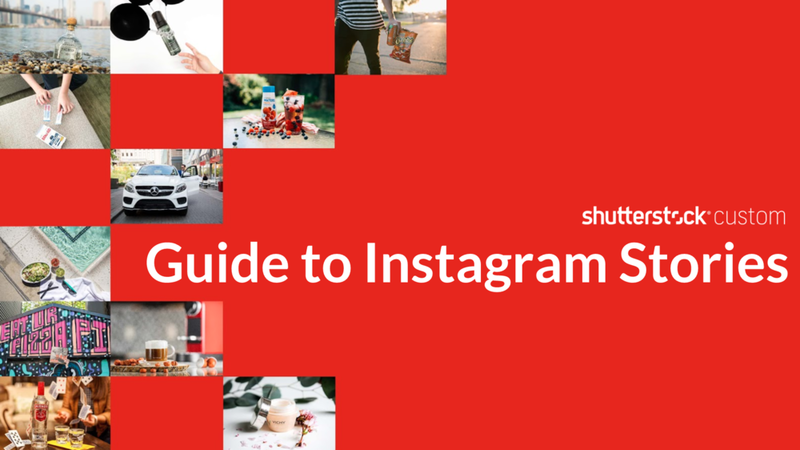 We hope this guide will provide you with all the educational tips and savvy tricks that you can use to start strategizing your visual business on Instagram! Have any tips you want to share? Comment them below!